For many people, there comes a time when they can no longer live on their own and depend upon nursing homes to provide them with comfort and care. Unfortunately, some nursing homes fail to live up to their obligation to patients. This is a terrible tragedy and our nursing home neglect attorneys urge every family member to be watchful for any signs of abuse or neglect during holiday visits to loved ones in nursing homes. Nursing home neglect is just as dangerous, in many cases, as abusive behavior. When a nursing home has assumed the responsibility of providing care to a vulnerable senior and the nursing home fails to do so, then the senior could suffer a number of very serious health consequences. When a senior is suffering from neglect, the senior may be even more reluctant or unable to speak out than in cases of outright abuse, since complaining about inadequate care could be seen as just making trouble. As such, it is especially important for visiting family members to be on the lookout for signs of neglect. If this neglect is occurring over the holidays at a time when relatives and friends tend to visit more than at other times during the year, it is an indication that something is very wrong indeed in the nursing home. Malnutrition or dehydration. This might occur as a result of the senior not being brought proper meals or water or not being helped to eat if there is a problem that makes mobility difficult for the senior. An untidy appearance or filth in the senior’s living conditions. If the loved one you are visiting looks dirty or has a dirty room, then this can be a sign that the nursing home is failing in the basic tasks of keeping the living space clean and tending to personal hygiene needs. Unexplained changes in behavior, depression or anxiety can also be signs that neglect is occurring. If you suspect neglect, then you should follow up and try to find out what is going on. Talk to the senior to see if you can get any information about care. You should also notify the proper authorities. The Massachusetts Elder Abuse Hot Line takes reports of elder abuse and can be reached seven days per week, 24 hours a day at 1-800-922-2275. You may also report elder abuse at Designated Protective Services agencies throughout the state. A full listing of this agencies can be found on the website of the Executive Office of Elder Affairs. An attorney can also offer assistance in taking action in cases of nursing home neglect. 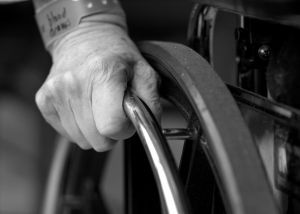 If you or a loved one has been the victim of nursing home abuse in the Greater Boston area, contact the Law Offices of Jeffrey S. Glassman, LLC for a free consultation to discuss your claim. Call 1-877-617-5333.